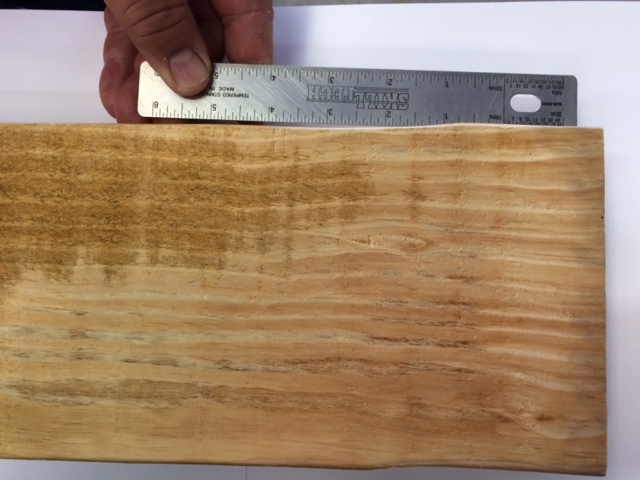 With the arrival of grade scanners in many southern pine production lines, there is a growing need to be much more precise with the planer machine work to plane a defect-free piece of lumber. Machine defects that the naked eye will miss on the production line, the scanners easily pick up and if only a .001” more than the parameters of the scanner the system may downgrade the piece or trim it off. (j) Machine bite is a depressed cut of the machine knives at the end of the piece. Very light machine bite is not over 1/64″ deep. Light machine bite is not over 1/32″ deep. Medium machine bite is not over 1/16″ deep. Heavy machine bite is not over 1/8″ deep. Very heavy machine bite is over 1/8″ deep. (l) A machine offset is an abrupt dressing variation in the edge surface which usually occurs near the end of the piece and without reducing the width or without changing the plane of the wide surface. Very light machine offset is a variation not over 1/64″. Light machine offset is a variation not over 1/32″. Medium machine offset is a variation not over 1/16″. Heavy machine offset is a variation not over 1/8″. Very heavy machine offset is a variation over 1/8″. (o) Wavy dressing involves more uneven dressing than knife marks. Very light wavy dressing is not over 1/64″ deep. Light wavy dressing is not over 1/32″ deep. Medium wavy dressing is not over 1/16″ deep. Heavy wavy dressing is not over 1/8″ deep. What is being experienced with the scanners today is that if slight deviations combined with an allowable defect which is hard to see with the naked eye the scanners are seeing them. An example is within the grade of Prime with an allowable edge wane along with a slight deviation in the eased edge of the adjacent edge the scanner sees less than the nailing edge required, and it will drop the grade, or if the programmed pricing data overtakes it, it will trim it back. With that being said we will not be allowed the loose machine work that was ok in days gone by. This issue with poor machine work can be addressed with proper alignment as discussed earlier. The lumber must not have the opportunity to move about during the cut, and it is even more critical the faster we run because of the ricocheting while in the cut. If we attempt to bend the lumber as it passes through the planer, then it has to rebound by bending. Kiln dried SYP is resistant to bending thereby it tries to stick in the planer if we bend it. The option when the lumber sticks, is that we loosen the machine up and push it through which even adds to deviations from a perfect line of cut causing defects. When we tighten down on holding devices to lessen the defects, then we are back to the machine not wanting to feed. By keeping the lumber flat as it travels through it allows the planer to evenly dress a true line of cut which reduces the opportunity for bites, wavy dressing and face skip because the machine is allowed to take an equal cut with top and bottom heads with the lumber being stable during the cut. Most often edge offsets which are also described and listed as per allowances in par. 720 are caused by the lumber being disrupted side to side while passing through the planer. In some installations, the bridge and feedtable are set by a line being pulled off the long guide in steel frame machines which have lead in them. This set brings the lumber into the machine at an angle, and then the planer tries to push it back to a straight line causing offsets on leading edges. It is best that the lumber comes into the machine at a perfect 12:00 o’clock direction to allow the machine lead to do its job in holding the lumber firm during the cut. Offsets on the tail end can come about by nonaligned hold over shoes behind the side heads which disrupt a true exit for the lumber. The condition of the outfeed roll must be perfectly flat from side to side with the top roll in like manner, or it will skew the lumber to one side while exiting causing offsets. With all that being said the synopsis of a defect free alignment is a straight shot through the machine.